Experts from around the world shared their experiences adapting new technologies to museum operations at a forum in the Palace Museum, or Forbidden City, in Beijing. Managers from world renowned institutions such as the Louvre Museum in Paris, the State Hermitage Museum in St. Petersburg, Russia, and the Tokyo National Museum, as well as domestic facilities like the Shanghai Museum and Nanjing Museum, said they took part to learn about "smarter" measures to protect cultural relics. The two-day forum, presented by the Palace Museum and internet giant Tencent, began on Tuesday. "New technology plays crucial roles in various aspects of museum operations today, ranging from visitor reception, restoration and display of cultural relics to academic research," said Shan Jixiang, the Palace Museum's director. "A few years ago, when talking about new technology in museums, it usually only meant auxiliary channels," he said. "However, we are marching into an era when culture gets mixed with new technology on a comprehensive scale and deeper level." For example, based on big data analysis, the museum closed its box office and began to sell all of its entry tickets through online platforms in October. The museum also digitally records its 1.86 million cultural relics in inventory, uploading the information online for the public to use. At the forum, Shan introduced equipment used in the museum's new cultural relic restoration lab. The lab was visited by President Xi Jinping and US President Donald Trump during Trump's visit to the Palace Museum this month. Shan said restoration work is closely mingled with scientific research. As many as 33 academic study projects are underway with the ongoing restoration of the Hall of Mental Cultivation in the museum, which was the home to the last eight emperors of the Qing Dynasty (1644-1911). "Creativity lays the foundation of sustainable development of cultural heritage," Marielza Oliveira, director of the UNESCO office in Beijing, said at the forum. "Many heritages in the world are in danger, but we can categorize and record the human knowledge in digital ways to promote mutual understanding among different cultures," she said. Oliveira praised China's efforts in terms of cross-border cooperation in the field. In 2016, the Shenzhen Declaration, which was released at a UNESCO forum in the southern Chinese coastal city, set a goal to enhance the role and capacities of museums for the protection of cultural heritage through the adaptation of new technological standards. Another concern for museums around the world is keeping new generations interested in museums. At the forum, officials from the Hermitage showed their virtual reality exhibition based on three-dimensional modeling, and the Louvre gave samples of their multimedia devices, among many other successful examples. 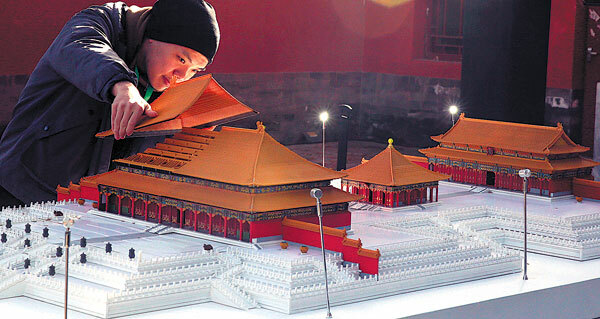 In 2015, the Palace Museum and Tencent organized a competition to get young Chinese designers geared up to develop emojis, games and other culturally creative items inspired by elements within the Forbidden City. Some winning items were shown at a digital exhibition in the museum. The exhibition will last until Dec 8. The exhibition also displays recent achievements made by overseas institutions with close ties in China, such as Google Arts and Culture and Japan-based digital art group teamLab. For instance, Google Arts and Culture has cooperated with 28 Chinese museums to hold 500 virtual exhibitions online, showing more 13,000 exhibits.